A beef cattle herdsman is responsible for the daily care and management of the cattle under their supervision. A beef cattle herdsman is tasked with all aspects of maintaining the health of the cattle kept at their facility. Their duties generally include giving vaccinations, deworming, tagging or branding, feeding, calving, performing artificial inseminations, trimming hooves, keeping detailed health and production records, and working closely with the veterinarian. Computer skills are a plus since many farms have developed databases and spreadsheets to track their herd performance statistics. The herdsman may also be involved with supervising other farm employees and staff members, ensuring that all tasks are completed properly. Additional duties may include transporting animals by trailer, assisting with marketing, raising hay or other forage crops, performing routine farm maintenance tasks, maintaining pastures, and handling any additional duties as assigned by the farm owner or manager. A beef cattle herdsman is usually on call for any emergencies and must work some evenings, weekends, and holidays. Work hours may be greatly increased during particular seasons, so a candidate should have some flexibility to allow for that variation. Candidates for this role should also be prepared to work outdoors in widely varying weather and temperature conditions. A beef cattle herdsman can work in many related positions such as beef cattle farmer, ranch manager, beef extension agent, artificial insemination technician, or meat inspector. They can also transition into positions in the dairy industry (such as dairy herdsman or dairy inspector), cattle product sales, livestock feed sales, veterinary pharmaceutical sales, or other livestock career paths. Educational requirements for beef cattle herdsmen can vary from one job posting to the next, but many employers prefer a degree in Animal Science (or a related field). Many will also consider hiring someone with a high school diploma combined with significant practical experience in working with cattle. Herdsmen should have a solid knowledge of anatomy and physiology, reproduction, pedigrees, artificial breeding techniques, calving, milk production, basic veterinary care, and the nutritional requirements of cattle in different stages of production. Many professionals start on the path to becoming a herdsman by first working as farm staff members or assistant herdsmen. Some beef cattle farms also require their management staff to hold CDL driver’s licenses for driving tractor trailers (to pick up and drop off cattle from auctions, stockyards, and processing facilities). Herdsmen also tend to operate many different pieces of farm equipment including tractors, trucks, and manure spreaders. There are also many beef internship programs that can provide valuable hands-on experience and develop the skills that will prepare a candidate to become an integral part of the beef cattle management team. A background in cattle showing or judging can also be helpful in developing cattle management and evaluation skills. Most U.S. beef cattle herdsman job postings reviewed in early 2015 had salaries that ranged from $30,000 to $50,000. 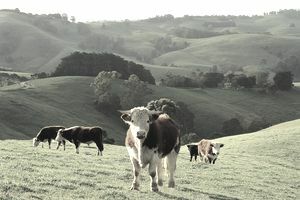 Survey data from the Bureau of Labor Statistics (BLS) revealed that the median pay for the category of farmers, ranchers, and agricultural managers was $69,000 per year (though this includes many lucrative management roles for other agricultural careers and does not offer individual salary information for beef herdsmen). Beef Herdsman positions often have a variety of associated fringe benefits in addition to the standard salary package. Additional benefits often include free housing and utilities provided on the farm, the use of a farm truck, health insurance, paid holidays, performance bonuses, and paid vacation time. According to the surveys conducted by the Bureau of Labor Statistics, the demand for farmers, ranchers, and agricultural managers will decline somewhat over the decade from 2012 to 2022. The decline may not be so sharp for the niche of beef herdsmen since the beef market has shown strength in recent years. Beef herdsmen can also move into other agricultural roles, making use of their transferable skills.